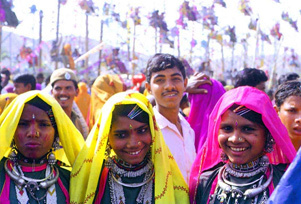 Celebrated in the month of March (fortnight after Holi), Chitra Vichitra is the largest Tribal festival in Gujarat. Name of the festival is derived from the epic novel Mahabharata. Chitravirya and Vichitravirya were believed to be the sons of King Shantanu (In epic Mahabharata, Shantanu was the king of Hastinapur), step brothers of Bhishma (In the epic Mahabharata, Bhishma was the eighth son of Kuru King Shantanu). Locals say that Chitravirya and Vichitravirya were once the residents of the town and used to cure people diseases by making them drink the water of this site. Tourists who want to see the social and customs of the Adivasis (tribal people) then they should go to Chitra Vichitra festival. The festival commences on a full moon night, all the women gather at the river front and mourn for their dead relative. Next day fair splashes off with everyone dressed in colourful colours. All the men don blue shirt, dhoti and a red or saffron fenta or turban while the women are decked up in ghagras along with heavy silver jewellery. Here one can see more than hundreds stall, each selling sweets, handicrafts and various food items. People visit here in big groups; people dance and celebrate for the entire day. Locals say that festival serves as a platform for people who are looking for prospective groom or bride. Numerous couples have been known to elope directly from the fair site. Every year the festival witnesses a huge footfall.